The invasive brown marmorated stink bug, Halyomorpha halys (Stål), has become a serious pest in mid-Atlantic apple orchards. Because no decision support tools exist for H. halys management, calendar-based insecticide applications have been the only successful technique for mitigating H. halys injury in orchards. Following the identification of the two-component aggregation pheromone of H. halys, we conducted a study to determine whether biological information generated by traps baited with this pheromone and pheromone synergist could be used to make management decisions. In this study, experimental apple orchards were treated with a H. halys-targeted insecticide only when a predetermined cumulative threshold of either 1, 10, or 20 adults per trap was reached. Once threshold was reached, two alternate row middle sprays 1 week apart were triggered and the threshold was reset. For comparison, some orchards were also subjected to a weekly alternate row middle spray or left untreated as controls. At harvest, significantly less fruit injury was observed when treated weekly or using a threshold of 1 or 10 H. halys adults per trap to trigger insecticide applications. Orchards treated using a cumulative threshold of 20 adults per trap or when left unsprayed had significantly higher fruit injury. In addition, insecticide applications were reduced by 40% using a threshold of 10 adults per trap. Our results suggest that baited pheromone traps can be used as decision support tools to trigger insecticide applications when needed to mitigate risk and effectively manage H. halys in apple orchards. 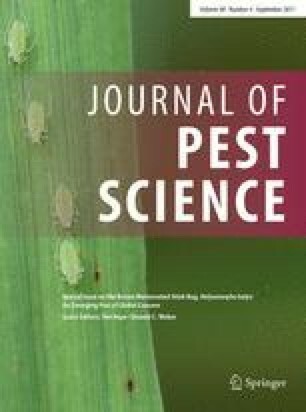 Special Issue: The brown marmorated stink bug Halyomorpha halys—an emerging pest of global concern. The authors would like to thank Nate Brandt, Zach Moore, and Brittany Poling for assistance with trap deployment and data collection. We express our gratitude to Tom Tworkoski for providing additional apple plots for experimental tests. This research was supported by USDA-NIFA Specialty Crop Research Initiative award #2011-51181-30937. Mention of trade names or commercial products in this publication is solely for the purpose of providing scientific information and does not constitute recommendation or endorsement by the United States Department of Agriculture.